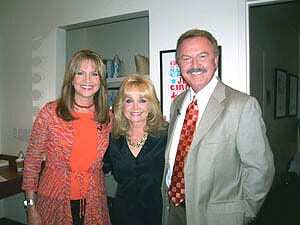 Barbara Mandrell appeared on Crook & Chase as part of the show’s six-week stint of live tapings at the Country Music Hall of Fame. In the interview, she discussed her passion for gardening and the upcoming public dedication of the Nashville Music Garden on Sept. 29. Located at the corner of Fourth Avenue and Demonbreun (in the Hall of Fame Park), the 2,700-square-foot public garden honors those that have made a positive impact on Nashville’s entertainment industry. The garden was conceptualized three years ago when Mandrell gave her namesake rose to friend and avid gardener Pat Bullard, trustee of the LifeWorks Foundation. Reba McEntire will perform her new song, “Consider Me Gone” on NBC’s hit summer series America’s Got Talent Wed., Aug. 26 (9-10 p.m. ET). McEntire released her 31st studio album, Keep on Loving You, on Aug. 18. The lead single from her new album, “Strange,” has become her second consecutive Top 10 single of 2009 and her new single, “Consider Me Gone,” is currently rising up the country charts. The Oaks will also appear on Feed The Children’s “Americans Feeding Americans” television special. Gloriana is back in New York City this week opening for Taylor Swift on her Fearless 2009 Tour at Madison Square Garden on Aug. 27. While in town the group will have their first national television performances live on Good Morning America Fri., Aug. 28 and the Today Show, which will air on Friday as well. The band is promoting its self-titled album (Emblem Music Group/Warner Bros. Records), which debuted at No. 2 on the Billboard Country Album Chart and No. 3 on Billboard’s Top 200. The album had the best first week sales of any new country artist with a debut album in 2009. Their single “Wild At Heart” is the best selling song by a new country act in 2009 having sold 300,000 copies to date.